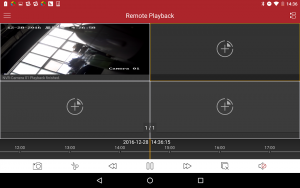 iVMS-4500 app is available on Android and iOS devices for versatile video management of Hikvision OEM DVRs, NVRs, IP cameras, encoders, decoders and other Hikvision products. It provides multiple remote system functions including real-time live camera view, date/time search of events and recorded video playback, video file backup and configuration of the devices connected. When properly configured by CLEAR IT SECURITY it can be used to meet the needs of your remote monitoring task. With it’s easy-to-use operations and intuitive interface, this software can be used by surveillance projects of various sizes and needs. Please Note: This guide assumes you have already configured your iVMS-4500 app. If you haven’t already downloaded, installed and configured the iVMS-4500 app, click here for information on how to do so. These instructions are supplemental to the official Hikvision User’s Guide available here. This screen will show you a real-time, remote live view of your cameras. You can find the live camera feed view by tapping on the 3 horizontal lines (menu button) in the top-left corner of the iVMS-4500 app and selecting Live View. On the Live View screen, tap the 2 cameras (button) at the top right hand corner to select the cameras you wish to view. Place a checkmark next to your system’s name and tap Start Live View to begin watching live. You can also tap on the > on the left to choose only certain cameras to view. You can change the # of cameras able to be viewed on the screen at once by tapping on the 4, 9 or 16 buttons. You can also swipe left and right to go between pages of cameras. Double tap on any camera to enlarge or zoom in. This screen will show you all recorded video from your cameras. You can find the remote playback view by tapping on the 3 horizontal lines (menu button) in the top-left corner of the iVMS-4500 app and selecting Remote Playback. On the Remote Playback screen, tap the 2 cameras (button) at the top right hand corner to select the cameras you wish to playback. On the Camera List screen, tap on the From and To fields, then choose the date/time range you want to playback. Place a checkmark next to your system’s name and tap Start Playback to begin video playback. You can also tap on the > on the left to choose only certain cameras to view. Once it begins playing from the time you selected, you can use your finger to slide the time indicator left or right to go forward and reverse. 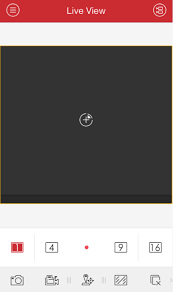 You can use the playback toolbar to take a picture, cut, pause/play or change playback speed. For full featured searching, login to the DVR/NVR locally or via iVMS-4200 on a PC.